This content model overview describes the supported content for a HeaderedContentControl. The TabItem class is a type of HeaderedContentControl. A HeaderedContentControl's Header content is typically used to label or identify the control's primary contents. For example, a TabItem's header is the content that appears on the tab, while its primary content appears in the panel. In the following illustration, "Font", "Character Spacing", and "Text Effects" are examples of header content. The Header property supports both text and UIElement content. The Header property accepts text. 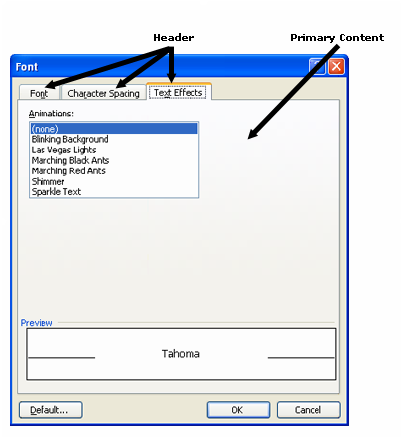 The following example shows how to add text content to a control's header. The Header property can also accept a single UIElement as its content. Examples of UIElements include Image, StackPanel, and Rectangle. The following example shows how to add a UIElement to a control's header. There are a wide variety of UIElement types that can be used as header content, including those that belong to the following type families. The content of a HeaderedContentControl is typically used to contain the control's primary contents. For example, the content of a TabItem is what appears when the TabItem is selected. The Content property which the HeaderedContentControl inherits from ContentControl supports both text and UIElement content. The Content property accepts text. The following example shows how to add text content to a control. The Content property can also accept a single UIElement as its content. Examples of such elements include Image, StackPanel, and Rectangle. The following example shows how to add a UIElement to a control. For more information about Content, see the ContentControl Content Model Overview. The following classes inherit from the HeaderedContentControl class and may be used to display the content described in this overview. Note that this list only includes non-abstract types distributed with the Windows SDK. You may use other types that inherit from HeaderedContentControl. The HeaderedContentControl class can be used as content for the following types. Note that this list only includes types distributed with Windows SDK.